I was wrong. Tonight, on Hagara, we got a brand new one. Yes, that is a chunk of an ice wall lagging behind. No, I have no idea how that can happen. This is the first time I see it. The ball is prone to getting bugged and not moving after a bounce. This is recoverable on the 30% nerf, but very much a wipe on 0% if it happens at the wrong time. It’s possible, although extremely rare, to click the button with the correct timing but still die to Fading Light or Hour of Twilight). The bloody fire keeps bloody spreading in phase 2. Makes it such fun to kill the boss when it happens. Most people probably wouldn’t have noticed this one: if you switch Power of the Aspects off, the first tendon of the first pull you do will still be debuffed. 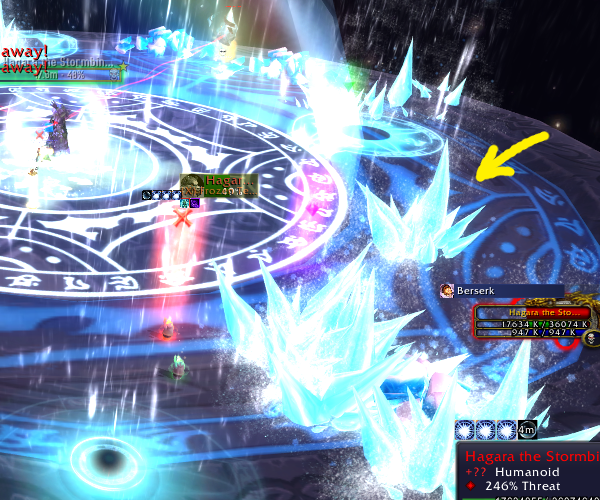 If you use Dream to mitigate a Hemorrage (the damage spike that happens when you get the head to 15%, 10% and 5%), the damage from Corrupted Blood will spike up to the highest strength possible and then remain there rather than settling back down, making healing extremely intensive at best and impossible at worst. And I could swear I’m forgetting some of them, especially for Madness. I hope MoP raiding is less buggy, but I’m not holding my breath. I was re-watching the Blizzcon streams – more specifically the Lore Q&A panel. And even more specifically, the guy who asked about the Giant Snake Tail of Gundrak. Most people I’ve seen commenting on that particular bit of the Q&A have a “he brought a printed screenshot? seriously?” type of reaction. Me? I had a “I wish I could do that” reaction. There’s something in the game that’s been bugging me. Not quite for several years like that guy, but since I’ve noticed it when I was questing in Darkshore post-Shattering. Meet Sentinel Lendra. She’s a questgiver in Lor’danel. …death knight eyes are not something you find on any random Sentinel. Logically, I know it’s probably just a model mishap and Blizzard’s reaction would be “whoops, sorry, we’ll get that fixed.” Even ignoring the fact that night elves are very, very against unnatural things such as death knights, her dialogue makes no reference to her being a death knight and her voice sounds like any other Sentinel’s, without the echoing that’s present in death knight voices. Still. Wouldn’t it be interesting if she was a death knight?